Tonight is New Year’s Eve and the last day for my self-imposed commitment to cook every day in 2014 from The New Galt Cook Book, a local community cookbook published in 1898. This occasion requires some celebration food and yet my family isn’t exactly in a celebratory mood. I decided to make something that will be recognizable and comforting. Without conscious planning it is also a bit of a nod to the meal I made on Christmas Day. Tonight’s supper is Mock Duck and Potato Puff. The Mock Duck recipe doesn’t list a contributor but the Potato Puff was shared by two contributors — Mrs. Capron and Mrs. Webb of Waterloo. Strip loin steak pounded flat and ready for the next step. My tasters purchased a 300 gram strip loin steak so that I could make this mock duck recipe. There’s another recipe for mock duck in the cook book but it uses liver. 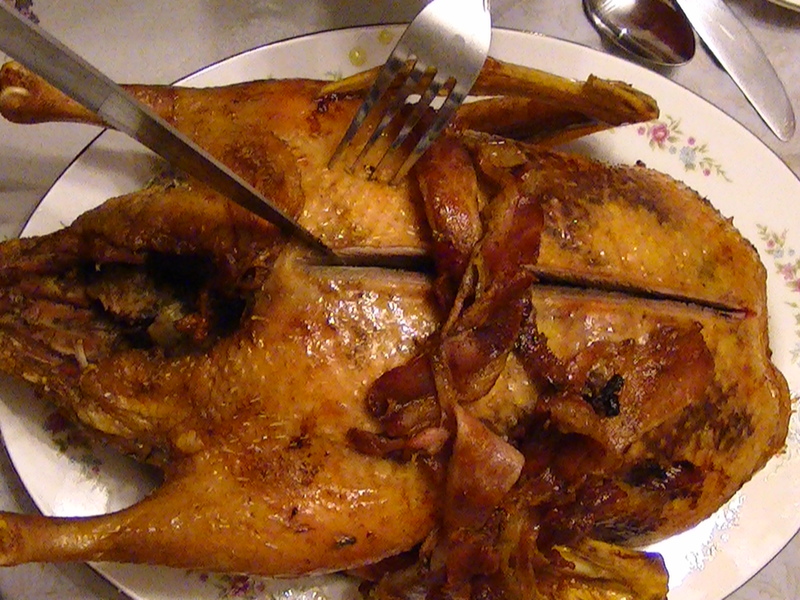 This version sounded much more appealing and much closer to the mock duck both my grandmothers used to make. The first step was to prepare the meat. After opening the package I pounded the steak with a meat mallet to flatten and tenderize it. 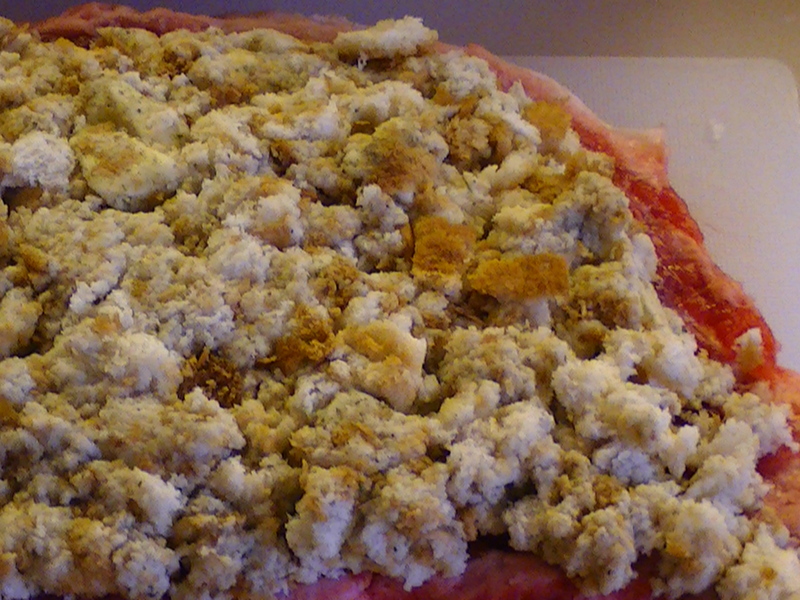 Stuffing placed on the steak ready to roll. I made a the stuffing/dressing from at least three slices of white bread. I tore the slices into small pieces and then seasoned with salt and pepper. Next I chopped a tablespoon of butter into bits to mix into the bread crumbs. I poured a dribble of milk into the bowl and mixed using my hands until everything was well blended. Finally I took the stuffing and patted it into place on the steak making sure the edges were clear. Mock Duck ready for the oven. 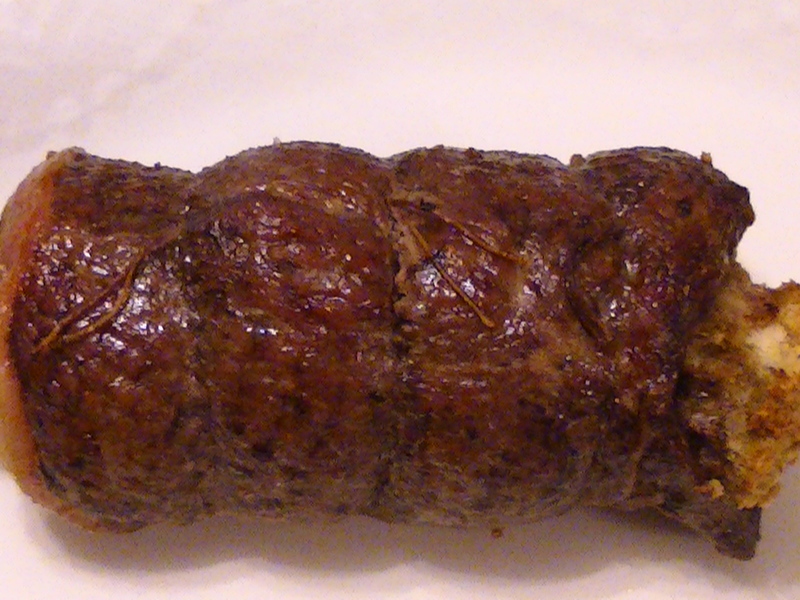 I began rolling the stuffing-topped steak like a jelly roll and then tied it in three places with string. It looked very small to feed five people but I put it in a baking pan and popped it in the 350 F. oven for 1 hour. As instructed I basted it with pan juices about three times. Once the hour was up I removed the pan from the oven and let it rest while I finished up the rest of the meal. Earlier I’d made some mashed potatoes and let them cool. I took 2 cups of the mashed potatoes and put them in a bowl with 2 tablespoons of butter I’d melted. I stirred until the potatoes were very smooth and creamy. I beat 2 eggs in a bowl until they were light and then added 1 cup of cream with a few shakes of salt. When these liquids were well blended I mixed them into the potatoes. Should I grease the deep baking dish? I decided not to add anything except the potato mixture. I smoothed the top and put the Potato Puff in the oven at 400 F. while the meat rested. I checked on the potato puff after 15 minutes and it was almost done. It was beginning to brown. I sliced the mock duck and placed them on a platter with some parsley sprigs. The top of the potato puff was a bit browner a few minutes later so it was time to sit down to our New Years Eve evening meal circa 1898. My tasters were eager. 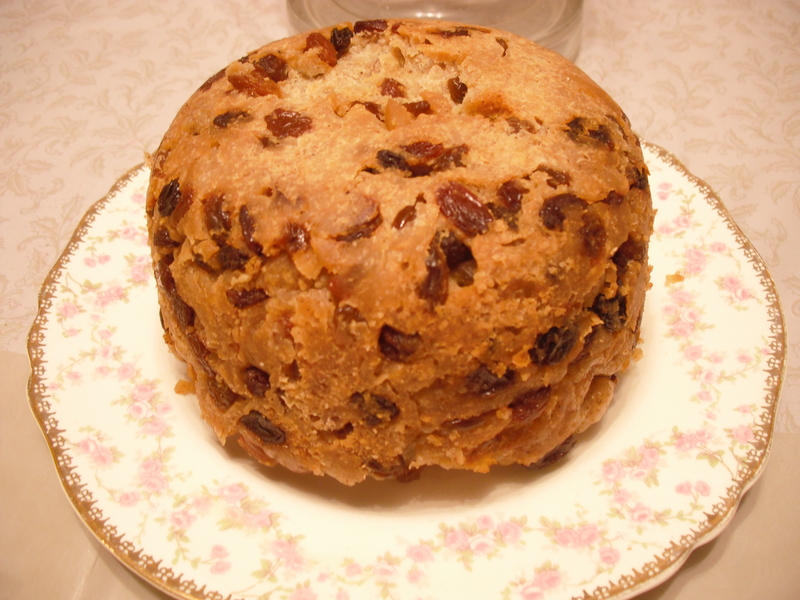 Mrs. Capron and Mrs. Webb of Waterloo both contributed other recipes I prepared in 2014. I’m assuming they are Mrs. J. W. Capron of Galt and Mrs. J. H. Webb of Waterloo. Annie Fairweather (or Farnveather) Scott was born in Galt around 1855 to Scottish born parents John and Catherine. John was a marble dealer and Annie was one of approximately twelve children according to Waterloo Region Generations. She was 24 when she married 26-year-old Joseph Wolverton Capron from Paris Ontario in November 1879. He was a Congregationalist and she was Presbyterian. His occupation is listed as gentleman. and their first child Anna Gertrude was born in January 1880 in Goderich where Joseph was now a Billiard Room Keeper according to her birth record in Ancestry.ca. Their next child Josephine Catherine was born in March 1883 in Chatham Ontario where again Joseph is operating a billiards room. The family must have moved to Paris Ontario by March 1886 since it is there that little Catherine Josephine died of a fever when she was three years old. They were in Galt by September 1887 when their last child Mary Austin was born. Joseph’s occupation again is listed as a gentleman. Although I can’t find the family in the 1891 census they must have remained in Galt since it is there that Annie (Mrs. Capron) died of stomach cancer in March 1895. This means that her recipe in the 1898 revised Galt Cook Book appeared after her death. 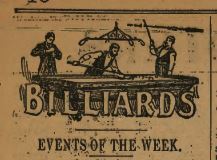 By December 1895 Joseph is playing billiards professionally and his name appears in an American paper called Sporting Weekly. Mrs. J. H. Webb of Waterloo is Helen Buchanan. She was born in 1851 in Branchton to John and Isabella. Her father was a farmer and a teamster. In the 19th century a teamster was someone who drove a team of horses or oxen not a member of a specific union for truck drivers. Helen was twenty when she married Doctor Joseph Hughes Webb in March of 1872. He had been born in Newmarket Ontario and was a Quaker. He is eventually listed as a Presbyterian like Helen. They have two children. Their first daughter Clara Belle dies when she is seven hours old. The doctor was unable to figure out why she died. The next year they have another daughter and also name her Clara Belle. By 1881 the little family have moved from Wilmot Township to the Town of Waterloo. 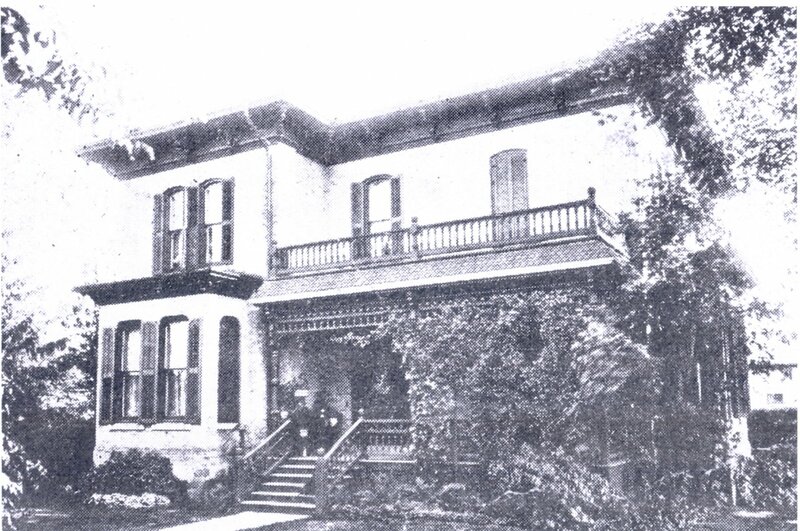 Here’s their house in 1906. Dr. Webb seems to have been a general practitioner as his name appears on both birth and death records in the community. It must have been risky for their daughter and Helen as he cared for patients with all sorts of communicable diseases. Helen didn’t die until 1935 when she was 85 years old. Mock Duck ready to slice. Our New Years Eve meal turned out great. To accompany the mock duck and potato puff I served some plain cooked carrots. Mock Duck made using this recipe is wonderful. There was just enough meat for the five of us to each receive one slice. All my tasters really liked the mock duck including the two of us who are not keen on steak. 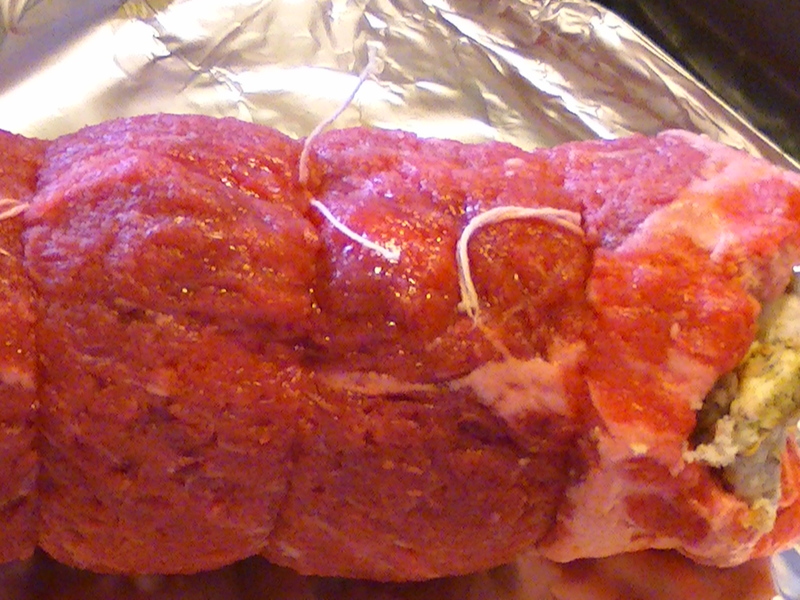 It came out tender and slightly pink inside but with a nice browning on the outside. The stuffing was good too. This is an easy recipe to make since it requires little attention and looks nice when served. It makes a cut of meat go further and can probably be made with a cheaper steak. I didn’t have enough pan juices to make gravy so I served the mock duck slices with some leftover gravy from another meal. This recipe can time travel as it stands but has lots of potential for creative cooks today. 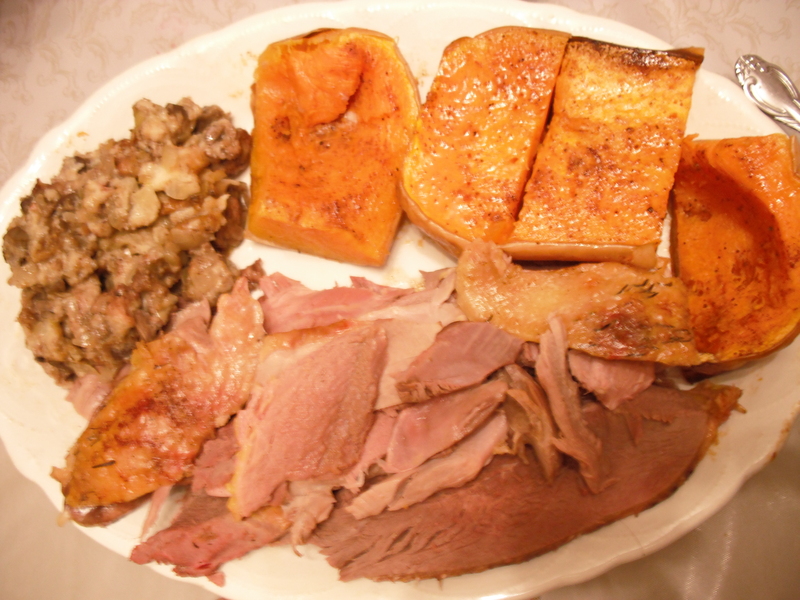 The dressing can be enhanced and the meat seasoned in different ways, plus it can be cooked for a shorter time to appeal to those who like meat medium rare. The Potato Puff is fine. Everyone liked it but it isn’t all that different from mashed potatoes. The bonus is that it uses leftover mashed potatoes — something that doesn’t reheat well in a world without microwave ovens. Making Potato Puff turned my somewhat lumpy mashed potatoes into a nice creamy version that had some extra calories and nutrition from the eggs. However, again I think this recipe could be transformed by a modern cook through changing the seasoning and cooking method. To help this recipe time travel to 2015 add some interesting seasonings perhaps simply some chopped chives, then bake in individual dishes to present with the rest of the meal. Thank you for joining me on this daily journey through time. 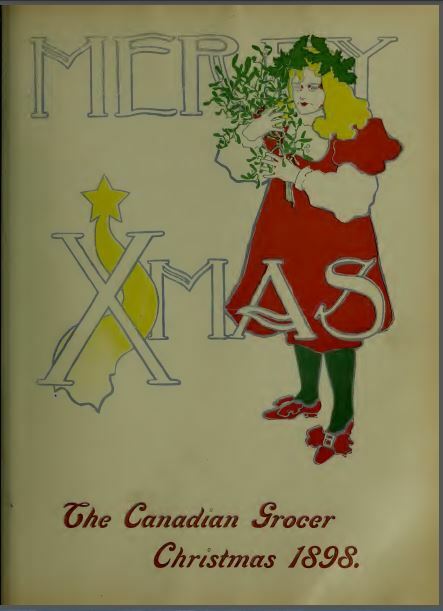 I hope you enjoyed exploring the food and lives of people connected to Galt Ontario in 1898. Happy New Year to you all! Mock duck is a particularly nice dish for luncheon. For a family of four, select a beefsteak weighing three-quarters of a pound, and free from loose fat or stringy pieces. Mix bread crumbs with salt, pepper and a little butter; chopped very fine. 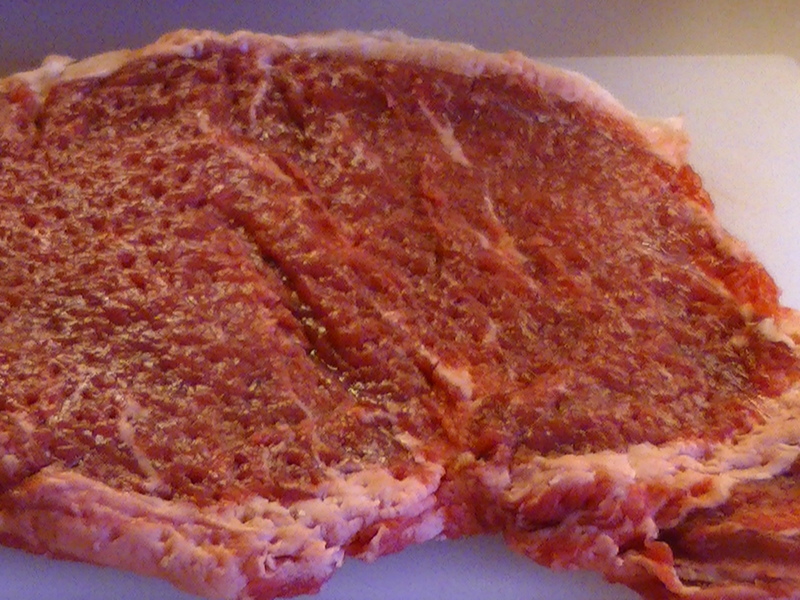 Moisten slightly and spread over the steak, half an inch in thickness, but not extending to the edges. Roll like jelly-cake and tie in three or four places with string. Place it in the oven for an hour, basting frequently, and it will come out nicely browned. 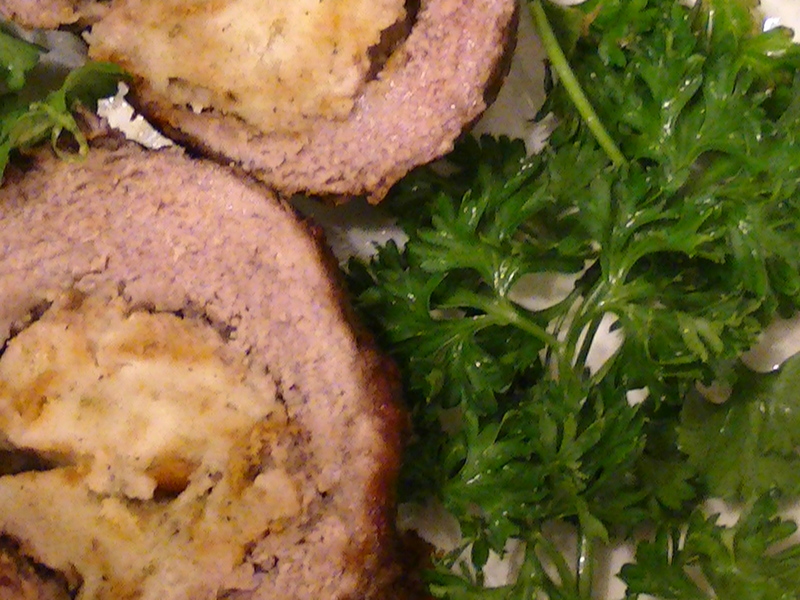 Cut in slices and serve on a platter garnished with sprigs of parsley. Potato Puff fresh from the oven. I spent much of today at the hospital with the family member who is receiving chemotherapy. It made me think of the women in The New Galt Cook Book (1898) who submitted cookery for the sick and home remedy recipes. It is amazing the level of care available today and so I’m making something completely different. There’s some boiled rice leftover from tonight’s simple supper so I’m going to make Rice Croquettes using a recipe contributed to the Pudding section by someone with the initials M.A.R. I used 3 cups cup of boiled rice and added 1/2 cup of milk, 1 tablespoon of butter, 1 tablespoon of white granulated sugar and a bit of nutmeg. I added a beaten egg and mixed it all together. Once it was cool I shaped them into flat patties and dipped them in the rest of the beaten egg and then rolled the patties in bread crumbs. I fried them in hot fat for 3 minutes. I have no idea the identity of M. A. R. There’s at least three contributors who use initials in this cookbook and I have no idea why they preferred to keep their identities secret. Rice croquettes were not a success for me. My rice was a bit too soggy to really deal well with the extra egg so I skipped that step and simply rolled them in bread crumbs. I found the flavour bland and not at all what I expected. I thought they’d be crispy outside and sort of soft inside. Instead they were just soft and blah. Maybe that’s why M.A.R. is anonymous. Boil one cupful of well washed rice in four cupfuls of boiling water for half an hour. Drain it, add to it half a cupful of milk, one tablespoonful of butter, one of sugar, half a teaspoonful of salt and a grating of nutmeg. 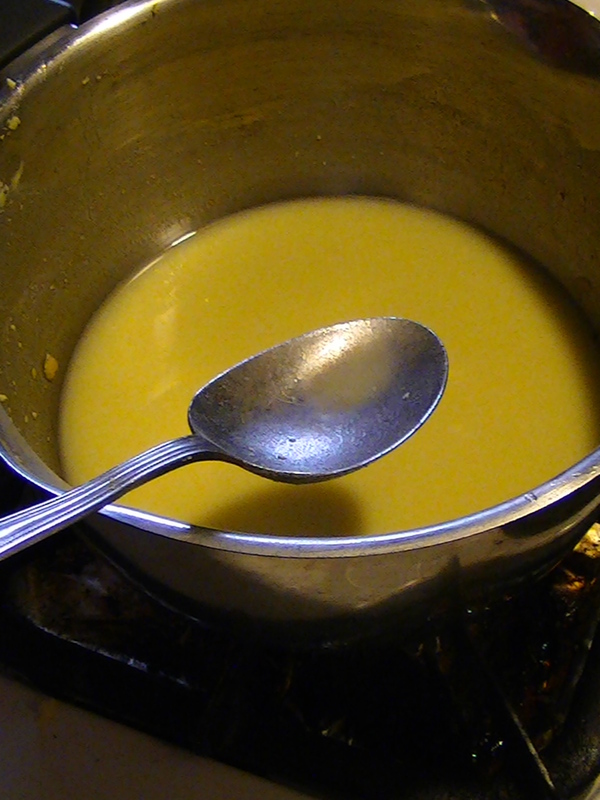 When this mixture boils, stir in rapidly one egg and set it away to cool. When cold, shape, dip in beaten egg, then in bread crumbs, and fry three minutes in hot fat. You’d think after 362 days I’d have my daily cooking and writing down pat but tonight I nearly forgot to cook. It was a busy day and suddenly it was almost 10 pm and I realized I hadn’t made anything from the 1898 New Galt Cook Book today. So I decided to leaf through the cookbook and see what turned up. Chocolate Cake caught my eye and I discovered that I haven’t made any of the five recipes for chocolate cake. I guess I kept saving them for a special occasion. This isn’t a special occasion but tomorrow a family member starts chemotherapy. I think we need a feel good recipe tonight. I selected the one contributed by Mrs. W. B. Wood of St. George. At first I thought this recipe was straightforward except for determining the amount of chocolate. It turned out to have a couple more quirks. Bakers chocolate recently changed the way they package their chocolate. I think they’ve returned to the way it might have been in 1898. Instead of the small squares packaged separately there are two bars marked in rectangles. It takes four of the rectangles to equal one of the old squares. I tried to break the bar into strips lengthwise but it broke horizontally instead. I ended up using the equivalent to 1 1/2 of the old squares of unsweetened chocolate. I dropped the pieces into 1 cup of milk in a saucepan and turned up the heat. Once the chocolate was melted and the milk had boiled I tried to stir in 2 beaten egg yolks. This wasn’t a great success. I realized later that some of the yolk cooked. I added 1 cup of sugar and turned the heat off. Should I turn the mixture into a bowl or make it in the saucepan. I continued with the recipe in the saucepan despite this potential cooked yolk problem and potential for hot batter before I realized I didn’t know if the instruction to add the “other half cup of milk” meant I’d used too much at the beginning or that I was supposed to add another 1/2 cup now to the 1 cup I’d used at the beginning. I decided to stick to the original 1 cup of milk and continued. I added 1 teaspoon of vanilla to the cake batter in the saucepan. When I stirred in the 2 teaspoons of baking powder the mixture became very foamy so I quickly mixed in the 2 cups of flour. The batter was now very thick. I spooned it into a greased square cake pan and baked it at 350 for 35 minutes. Mrs. W. B. Wood of St. George is another frequent contributor to this cookbook. I’ve made her desserts and drinks so she’s become familiar to me. She’s Ellen Elizabeth Malcolmson and she married William Bruce Wood a miller who eventually headed up Dominion Mills in Montreal. However, in 1898 they lived in St. George, Ontario. The 1891 census records William B. Wood (42), Ellen Wood (38) and their three children Margaret H. (16), Ellen M. (14) and Alexander (10). Imagine how excited these children might be at chocolate cake for dessert. I wonder if this recipe was so familiar to Mrs. Wood that she neglected a few important details. I am not impressed by my chocolate cake. It tastes of chocolate which is a bonus but the texture is a bit rubbery. I think I made some mistakes in interpreting this recipe. I should have let the chocolate and milk mixture cool a bit before adding the egg yolks. I should have poured everything into a bowl before adding the sugar and butter. 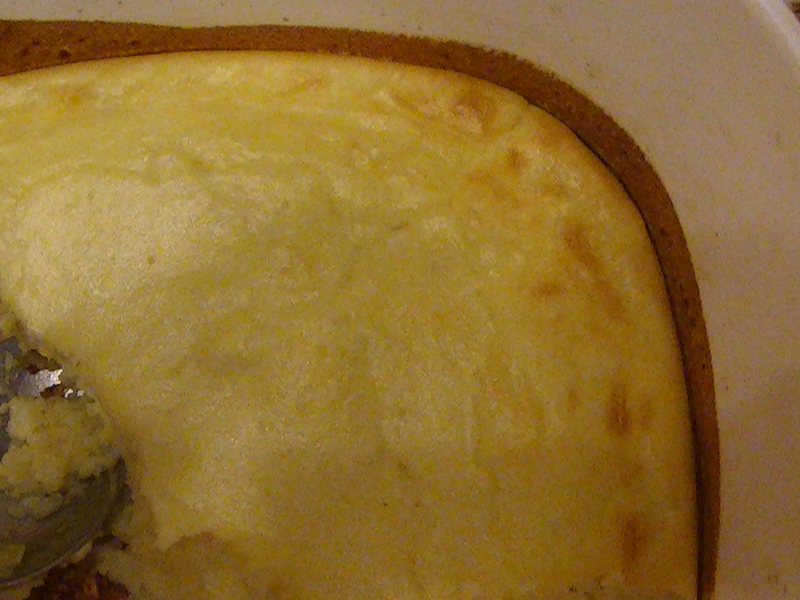 The mixture should have cooled even further before adding the vanilla, baking powder and flour. I’m still not certain about the amount of milk but suspect I should have added another 1/2 cup. This would have made a more liquid batter but then it would have spread evenly in the pan. Mine ended up lumpy. I assumed it would smooth out in baking. It did not. My baking powder used all its “fizz” in the hot batter and didn’t have much left for lightening the completed cake as it baked. All together this cake was not a success. I didn’t even bother to make the icing. It would have been wasting good icing sugar and it would not have improved this cake. One and one-half strips of chocolate, one cup of milk, one cup of sugar,two cups of flour, yelks of two eggs, two small tablespoonfuls butter, two teaspoonfuls of baking powder, one teaspoonful vanilla. Boil the chocolate in the milk for a few minutes, stir, add the yelks well beaten, stir till thick, then add sugar and the other half-cup of milk and other ingredients mentioned. Either bake as layer cake with icing between, or in one large cake with icing on top. ICING FOR CHOCOLATE CAKE – Three tablespoonfuls of milk, one-half cupful granulated sugar. Boil together for a few minutes or until it strings from the spoon. Take off the fire, flavor with vanilla and stir till cool before putting on the cake. We had another family Christmas celebration today and I made a beet salad from the 1906 Berlin Cook Book, the book I used everyday in 2012. After a wonderful potluck lunch, visiting with relatives, and music, I don’t want to make anything too challenging so I’m going to finish a recipe I started on Boxing Day. Today’s recipe from The New Galt Cook Book (1898) is for Pumpkin Marmalade and it was contributed by Mrs. Main and it takes several days to finish. I bought a pie pumpkin more than a month ago but it kept well in a cold part of my house. I did the first part on Boxing Day (December 26) and I’m completing the recipe today. The first step was to cut the pumpkin open and clean out the “guts” and seeds. My sister took the seeds to toast them in the oven. Meanwhile I cut the pumpkin into slices and peeled it. Then I cut it into small chunks and weighed them. I had approximately 1 pound of pumpkin that I put into a bowl with 3/4 pound white sugar and 1 pint (2 cups) of water. I covered the dish and put it in the unheated sun-room to keep cool and sit undisturbed for two days. Today I emptied the dish into a cooking pot but I wasn’t sure how much of the other ingredients to add. I washed and sliced 3 lemons and added them to the rest of the ingredients. It seemed about the right amount. The recipe talks of 5 lemons for a medium-sized pumpkin. My pie pumpkin was on the small side so I think 3 lemons will work. I took a chunk of ginger root, peeled it and chopped it into small pieces. I stirred everything together and left it to simmer for three hours. Unfortunately I forgot about checking the marmalade during supper and it nearly boiled dry. Part of it was quite caramelized. I removed it from the heat and set side a small portion to taste. Mrs. Main is either Matilda Jane Bishop wife of William Emerson Main or else she’s Margaret “Maggie” Lowell widow of Henry Main. I made Mrs. Main’s cake recipe on day 241 and discovered then that Maggie might be the most likely contributor since various relatives are also in the cookbook. She also has a dramatic history. By the time her recipe appears in the cookbook she has had five children, the last one five months after her husband’s sudden death in 1888. His death was sudden because he was murdered! He operated a private bank and brokerage and apparently one of his former clients was upset. He arrived with a firearm and shot Henry Main at his place of work. The client then went further down the street to a nearby hotel and shot himself. Maggie continued to live in Galt with her children until at least 1911 but I lose track of her at that point. She died in 1933 when she was 83. Pumpkin Marmalade ready to taste. Pumpkin marmalade is okay. I added too much lemon and so it is very tart. I didn’t add enough ginger since I can’t even taste it. The pumpkin texture is a bit odd since it is still in cubes but very soft. However, a family member who loves marmalade thought this was an outstanding marmalade. I think this recipe has potential. As mentioned I’d change the proportions I used and a modern cook might consider adding some of the spices used in marmalade. There was dissenting opinions on this idea. It could be cooked down further and become more like a jam. 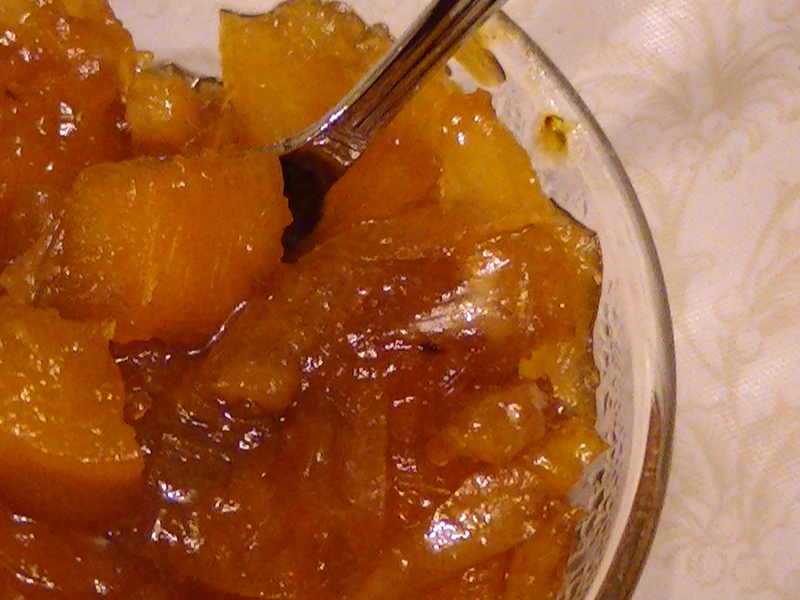 The next time you have access to a pumpkin consider trying this recipe although the work in preparing the pumpkin is onerous (peeling and cutting take quite a bit of time) it could be worth it if you like marmalade or are willing to experiment. 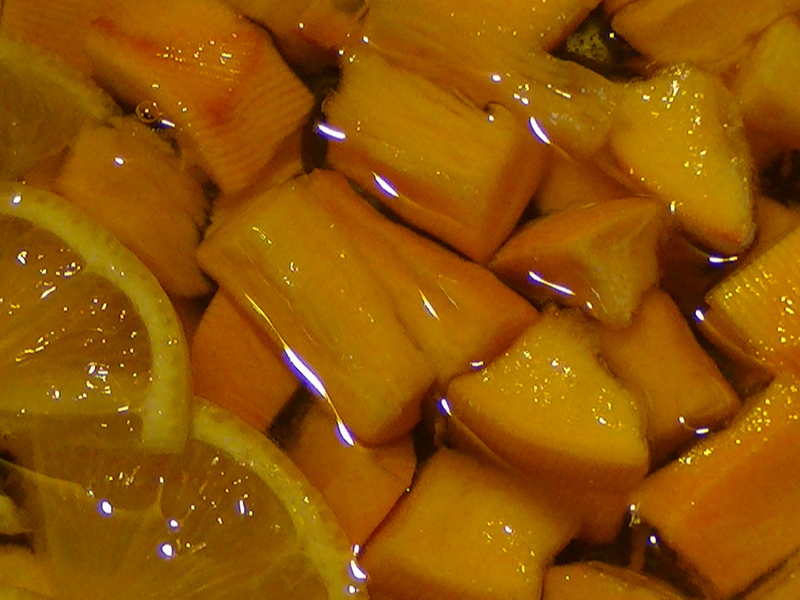 To each pound pumpkin cut in pieces, add three-quarters of a pound of sugar; put in a vessel a layer of pumpkin and sugar till filled, add one pint of water, let it remain two or three days, then boil with lemon cut in thin slices and whole ginger, boil gently three or four hours till the fruit is tender boil the syrup till thick. To a medium-sized pumpkin five lemons, one dozen pieces of ginger. Today is Saturday and my family is still in that post-Christmas holiday mood. No one has to go to work yet so we’re doing puzzles, playing music and relaxing. We are also beginning to tire of duck leftovers so it is time to make something completely different from the 1898 New Galt Cook Book. 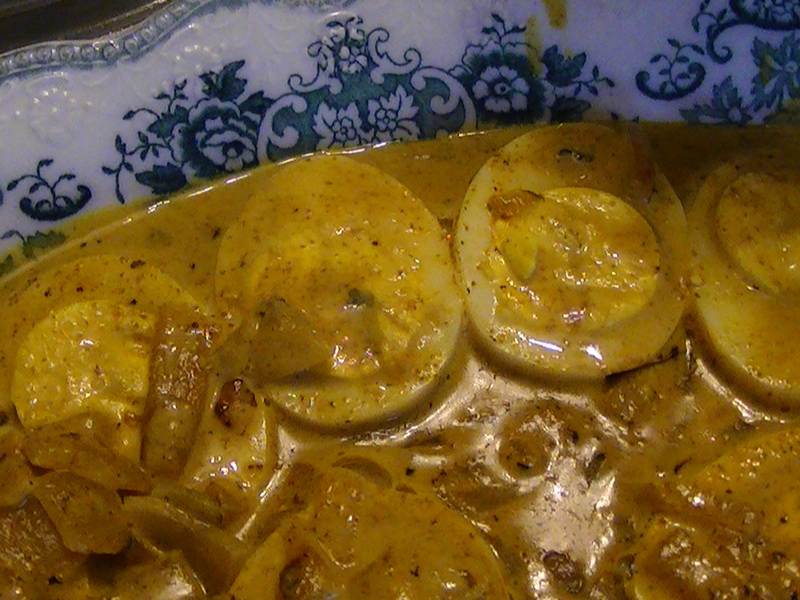 I’ve picked a recipe To Curry Eggs from the Eggs section contributed by Mrs. Sheldon. Since I’m not fond of eggs I’m trying it when there are plenty of taste testers around. I thought it might go nicely with a salad. I’ve selected Shrimp Salad since I don’t like shrimp either and several of my tasters love seafood. The recipe was contributed by the mysterious S.B.C. Starting to peel the cooling hard boiled eggs. First I put a dozen (12) eggs in cold water and turned up the heat. Ten eggs are for the curry recipe while the other two will be for the salad. Apparently the eggs need to simmer for 8 minutes to be hardboiled. 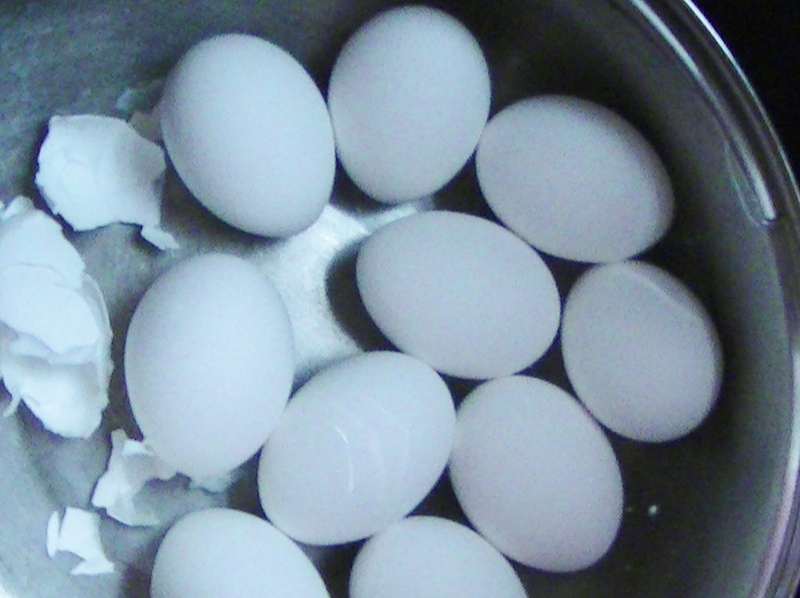 Check out this site for more about how to boil eggs. Next I started the salad since the dressing needed time to cool. I sliced one peeled hardboiled egg in half horizontally and removed the yolk to mash it. Then I put 1 gill (5 fluid ounces) of vinegar in a saucepan with 1 teaspoon of mustard, a pinch of sugar and the mashed egg yolk. I heated the mixture until it boiled and then set it aside to cool. 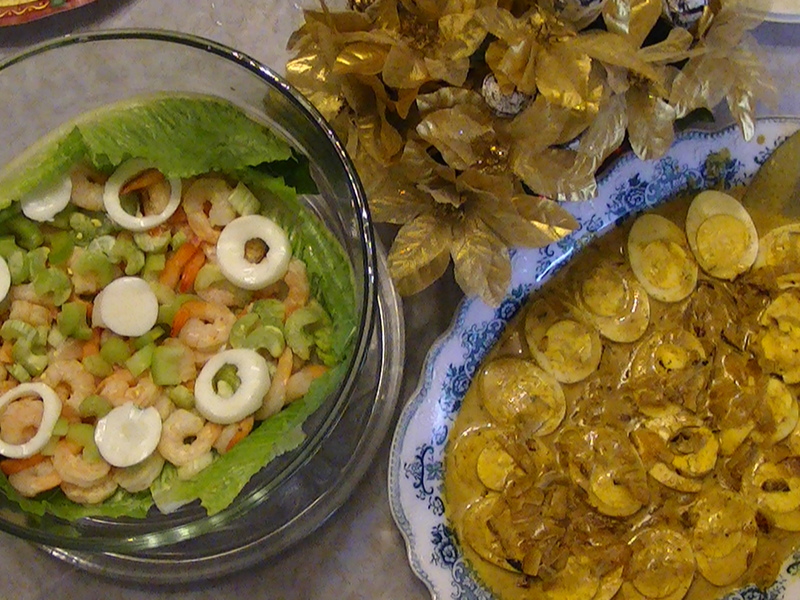 I prepared the glass dish for the salad by lining it with some lettuce leaves. The shrimp was already prepared so I put the shrimp around as well as two stalks of celery chopped and a pinch of salt sprinkled on top. I cut the white of the egg into rings and but was unable to find a jar of olives. I had the egg white rings ready to arrange once the dressing was poured on top just before serving. Once the eggs were boiled and the salad dressing cooling, I started the curry sauce. I chopped 2 small onions and fried them in butter until the pieces were nice and brown. Then I added 2 dessertspoons (2 teaspoons) of curry powder. I debated using the duck broth but instead used almost 1 pint (2 cups) of chicken broth. I left it to simmer gently while I cooled and peeled the hard boiled eggs. I sliced them in half vertically before setting them aside until the sauce was ready. I measured ¼ pint (½ cup) cream and added a teaspoon of cornstarch since we didn’t have any arrowroot powder. Once the onions were tender I carefully added the cream mixture to the broth. I let it simmer and thicken just a few minutes before adding the peeled and sliced hard boiled eggs. I removed the eggs and set them on a platter and poured the sauce over top. I attempted to arrange the sliced eggs as described but I wasn’t entirely sure what was meant by the flat ends. 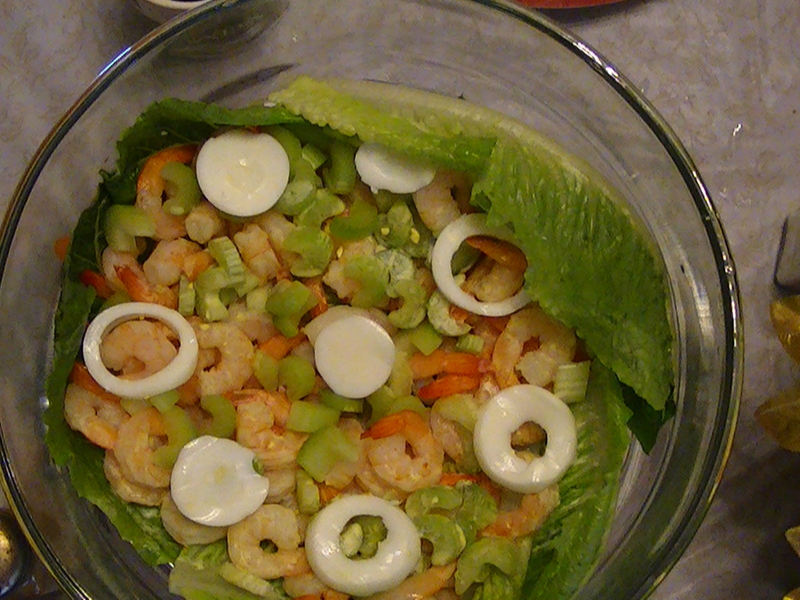 I poured the dressing on the shrimp salad and added the egg rings and olives to decorate the top of it. It was time to eat! Unfortunately S.B.C. remains a mystery but Mrs. Sheldon is interesting. I’ve pulled this information from primary sources on ancestry.ca and some family trees posted there. Mrs. Sheldon was Juliet Mary Demster (or Dunster) and born in Dorset England in 1846. Her father was a bookseller and stationer but her mother Rebecca died when Juliet was just two years old. Most of her brothers and sisters died when they were babies so the 1861 census in England shows her with one sister and her father. However, life must have taken a different turn because her marriage in 1872 to Joseph William Sheldon took place in Madrid Spain! Joseph was also born in England and their marriage was registered in England but they continued to be mobile. Their first four children were born in Bucharest Romania between 1873 and 1878. One of the children died as an infant. The next child was born in Breman Germany in 1881. By 1884 they were in London England and then in 1886 their son Edward was born in Galt Ontario. Their final child Ethel was born in 1889 also in Galt. Their birth certificates list Joseph’s occupation as Gentleman and yet the 1891 census lists Joseph as a farmer and they have seven children at home. Then in 1892 Joseph died of appendicitis! He was just 42. What was this like for Juliet? In 1901 she’s listed as head of household and six of the children are there too. The older boys are listed as manufacturers or machinists. They also have three domestic servants, two women named Jane and a man named Robert. She was still at Lot 12 Con 10 in North Dumfries Township in 1911 but with just a few of the children and a domestic servant. One of her sons lived nearby with his family. Eventually by 1921 Juliet lived alone in a stone house near her son. She died of arteriosclerosis in 1923 in Galt. Some of my tasters really like the eggs. They felt the curry had flavour and a little hit of spiciness. The onions were great with it and the sauce worked well with the eggs. I tasted the sauce and it is okay on its own but I think it would be better with coconut milk rather than cream and perhaps using a curry paste instead of the curry powder but then I like Thai food. I wonder if Mrs. Sheldon developed taste for curry while living in Eastern Europe. That area was still part of the Ottoman or Turkish Empire at the time. The shrimp salad seemed to be more about the presentation than the taste of the food. My tasters liked the shrimp (it is the type they use all the time) but we had to dig to the bottom of the bowl to get any of the dressing. The dressing is a bit thin for this salad but it tastes good. Ten eggs, one onion, two dessertspoonfuls of curry powder, quarter pint of cream, some arrowroot, nearly a pint of medium stock or good gravy. 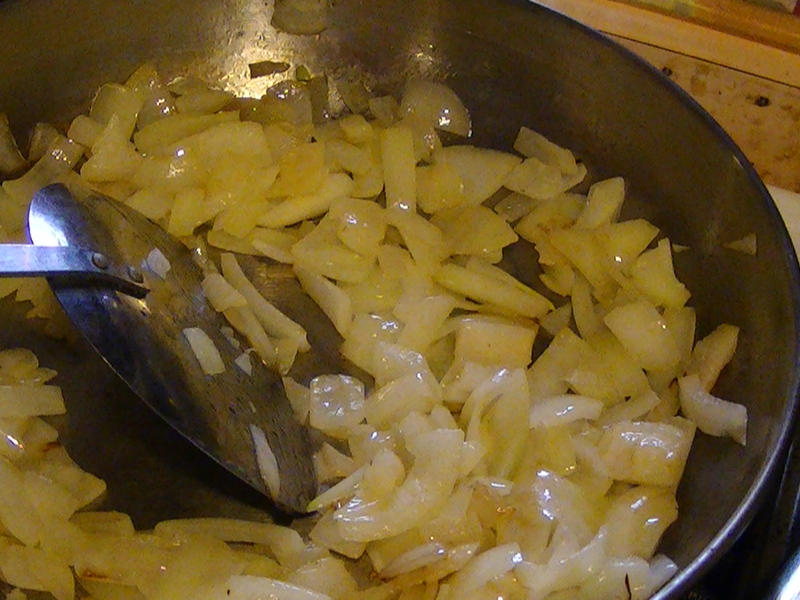 Fry one large onion or two small ones, a nice brown in butter, then add the curry powder and stock, or good broth, and set it over the fire to stew slowly until the onions are tender. Thicken the cream with a little arrowroot, stir it in and let all simmer for a few minutes, then add ten or twelve hard-boiled eggs cut in halves. Make them hot without allowing them to boil, and arrange them on the flat ends on a dish with the sauce over them. Line a glass dish with crisp lettuce leaves. Mix together one plate prepared shrimps (boiled and picked), two stalks celery, pinch salt. Place among the lettuce leaves. Pour this dressing over: One gill cider vinegar, one teaspoonful mustard, pinch sugar, yelk one hard boiled egg, mixed and well mashed. Bring to a boil, then cool. Cut white of egg into rings, place an olive in each, and arrange about the salad. Last night while putting away the leftovers from our wonderful Christmas dinner, an important question came up. What are we going to do with the carcass of the duck? Although we’d managed to carve most of the meat from the roast duck there was still meat on the bones. I checked the 1898 New Galt Cook Book and discovered the recipe for Turkey Soup could apply to duck too. 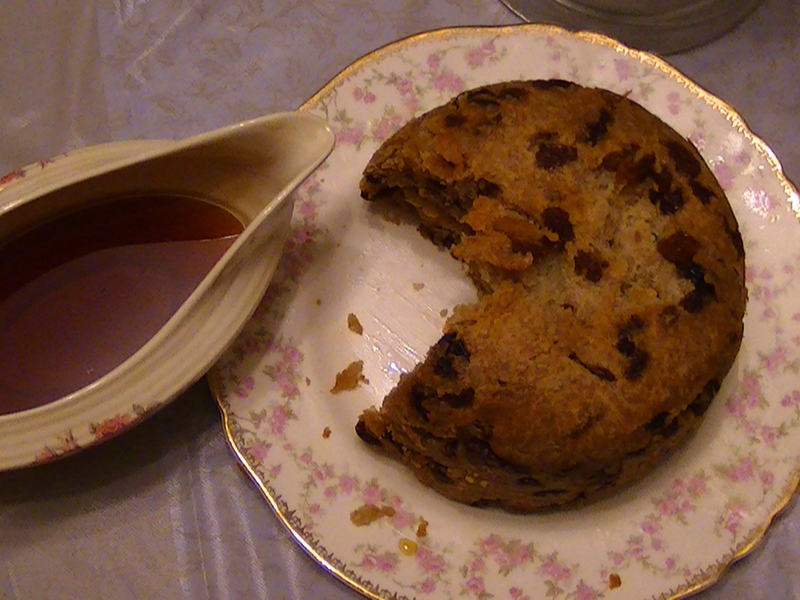 Mrs. James Young contributed the recipe. This afternoon I put the wings, legs, and body of the roast duck in a pot. I tried to break up the bones but they kept springing back so I put the main part in whole. I added 1 quart (4 cups) of water. I turned the heat low and left it to simmer for two hours. I checked on it every half hour or so to make sure the liquid wasn’t boiling away but it was fine. However, in the last half hour a family member wanted to be helpful and added more water. In the end it was fine since the next step involves adding some more liquid. I strained the soup and measured the broth. I put a quart of it into the clean soup pot and added 2 tablespoons rice, 1 onion chopped finely and then tried to figure out how much carrot to use. I started grating the carrot and used about two inches of carrot. The grated carrot eventually added colour to the broth. I left the soup to simmer for another hour and then once again strained the soup. I served the clear duck broth as a starter to our meal of leftovers so I had several tasters. Mrs. James Young is a familiar name since she contributed so many recipes to this cook book. Margaret McNaught’s sister Frances was one of the editors and lived in the home of her sister and brother-in-law James Young. Although this household was prosperous they seem to have also been frugal. 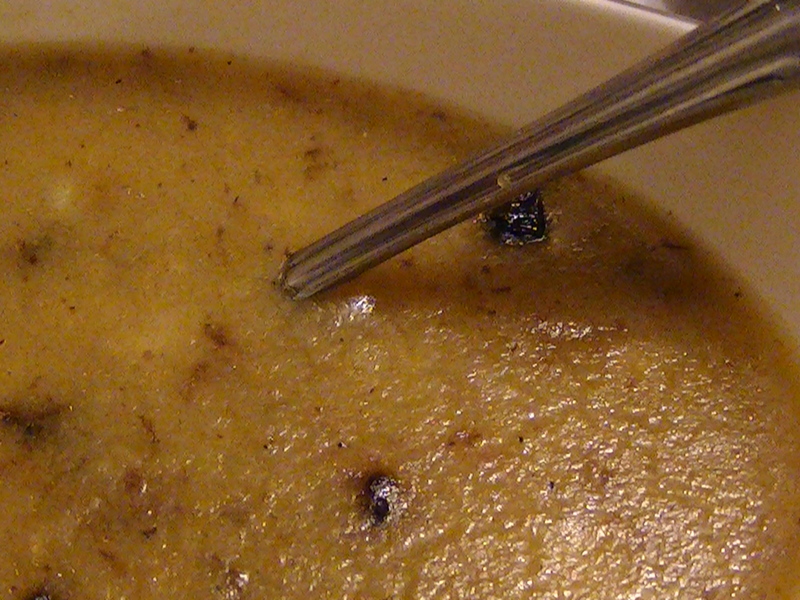 A soup like this fits this image since it uses leftovers but creates a broth suitable for guests. Most of the tasters couldn’t tell that it was duck. It simply tastes like chicken broth and that it would make a good base for further additions. I’m going to keep the grated carrot trick in mind for future use. It is an easy way to add some colour to a bland looking broth. More and more evidence is showing that chicken soup is actually beneficial in dealing with a cold so we’re keeping the leftover broth on hand for medicinal purposes! Bones of fowl or turkey, carrot, onion, celery, rice, salt and pepper. This is an excellent way to use the remnants of fowls or turkey on which considerable meat remains. Put in the soup kettle the carcass, and any bits of stuffing or gravy that remains. Pour over it one quart of cold water. Let the bones simmer for two hours (break the bones before putting them into the water). At the end of two hours strain your stock, wash the pot and put back your stock and add to it more stock if you have it, and if not, add boiling water enough to make a good quart, also a slice of carrot grated, a small onion cut fine, a piece of celery (the coarse pieces may be used for soup), and two tablespoonfuls of rice. At the end of an hour strain again, and serve, salt and pepper to taste.